» A comeback for the ivory bill? A comeback for the ivory bill? Depending how much the keys weigh, selling this old melodeon would likely become illegal . Petitioners have filed a proposed Oregon initiative that seeks to accomplish what the 2015 legislature failed to do: outlaw the sale of ivory and other parts of exotic or endangered species. Among the chief petitioners are Congressman Earl Blumenauer, whose address is listed as the Democratic Party headquarters in Portland, and former state Sen. Bruce Starr, a Republican from Hillsboro, who was narrowly defeated for re-election in 2014. Their proposed ballot measure, No. 68, was filed on Monday. It would outlaw the sale or purchase, or possession with intent to sell or buy, of anything containing parts from 11 species of animals including elephants, rhinoceroses, whales, and sea turtles. Unlike Senate Bill 913, which died in an Oregon House committee in June, the initiative does not mention mammoths. But it would allow the state Fish and Wildlife Commission to include mammoth ivory in the ban by issuing a rule. The measure would exempt components of items that are at least 100 years old if the parts from a prohibited species weigh less than 200 grams. To stay legal, buyers or sellers of such items — like an antique revolver with ivory handles, if there is such a thing — would have to be able to prove the item’s age. Also exempted would be musical instruments including pianos, without the requirement of them being antiques, but again the parts from prohibited species would have to weigh less than 200 grams. A piano has 52 white keys, and old ones traditionally were made of ivory. 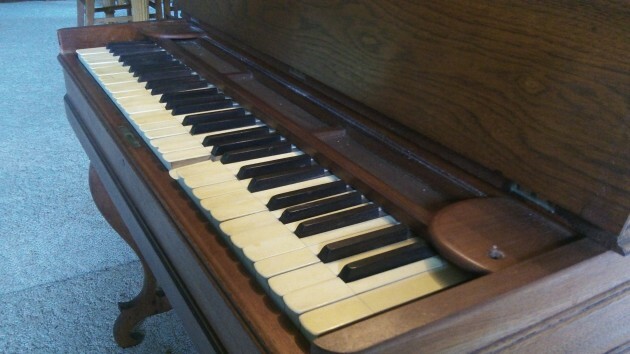 So a seller or buyer of such a piano — or an old melodeon, for example — would have to ascertain that the ivory veneer on each white key weighs less than 3.8 grams. So, what happens if an item is banned, but the seller and buyer, both Oregon residents, conduct the transaction outside of Oregon? Does the ban also restrict the movement of such banned items in or out of Oregon? Is it legal to conduct a trade transaction, just not a buy/sell? If a trade, can the “buyer” then buy back the item traded for the banned item?